On this day, OPC pastor, foreign missionary, and regional home missionary Donald Poundstone was born in Pasadena, California. A son of the manse, Poundstone attended UCLA, where he met his wife, Carolyn. Five days after their wedding, Poundstone and his bride joined the Peace Corp., volunteering for a two-year term in rural Brazil. Upon their return, he enrolled at Fuller Seminary and then transferred to Westminster Seminary, where he earned his B.D. degree in 1969. Poundstone served Orthodox Presbyterian congregations in Sewickley, PA and Portland, Oregon, before serving for a term as coordinator of training at the Evangelical Study Center in Larnara, Cyprus. Returning to his native soil, he served for twelve years as Regional Home Missionary for the Presbytery of Southern California. During that tenure he directed the birth and development of several OP congregations, including Big Bear, California, Escondido, California, Temecula, California, and as far away as Phoenix, Arizona, and Hawaii. From his undergraduate experience as a UCLA Bruin to his foreign missions service in the Middle East, Poundstone walked in the footsteps of his father, the Rev. Dwight Poundstone. 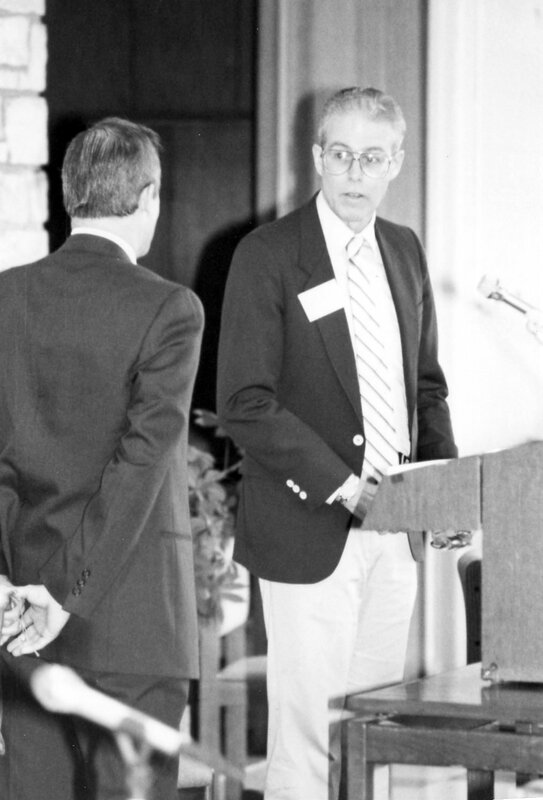 When the younger Poundstone moderated the 60th General Assembly in 1993, they became the second father-son combination to moderate General Assembly in the OPC, following Ned and Chip Stonehouse (and later joined in that accomplishment by Robert W. and Robert Y. Eckardt and Glenn and Robert Coie).